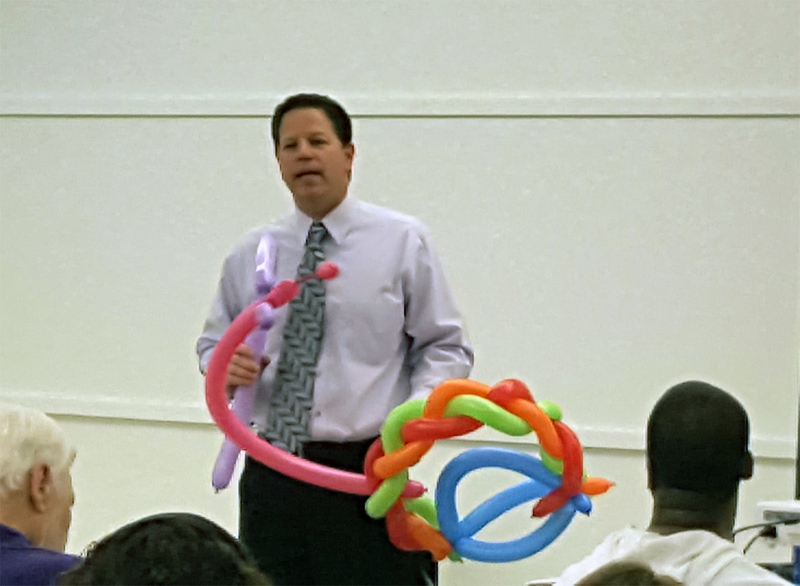 Conference planners turn to Dale Obrochta when they need a fun Speaker who knows how to twist a message into a presentation. Our goal is to provide the highest quality speeches to businesses resulting in a fun, educational meeting. 1. UNIQUE: Dale creates tubular latex art on stage to illustrate and drive home key points. 2. PROFESSIONAL: Skillfully presentation that twists together education content with humor. 3. CLEAN: The program is clean language and business professional. 4. TARGETED: The focus is on the audience benefit and not an inflated ego driven presentation. 6. RELAXING: You get to enjoy a stress-free service, as a veteran entertainer orchestrates the presentation, leaving you to focus on the big picture. Use your next meeting to inspire, educate, and entertain a result driven message about improving one’s image and reducing the negative stereotypes associated with your industry. 60-minutes just ticked by and your audience is still fascinated and listening intensely. Giggles of laughter echo around the room as educational anecdotes drive home the theme of the event. Intertwined in these stories is visual art that captivates the audience and propels concepts in ways that your audience has ever dream possible. With every tool extracted from his bag, people are brought to the edge of their seats in anticipation; laughter is heard with each joke. Every sculpture presented is a compliment to your great idea of hiring this unique speaker. 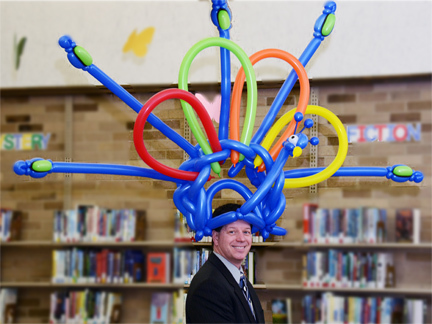 “We wear our image like a peacock wears its feathers,” says Dale, as he intertwines long colorful balloons to help establish his point about how social interaction helps develop your “perceived” image. The visual art captivates audiences attention while making key points memorable. Education, Entertainment, Experience all twisted together.